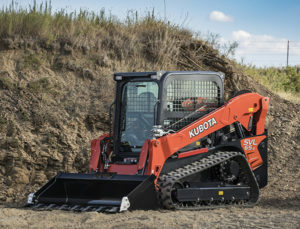 Designed as the smallest compact track loader of the three models in the SVL line, Kubota Tractor Corporation announced the release of the SVL65-2 for distribution through Kubota dealers beginning April 2019. The track loader features the Advanced Multifunction Valve (AMV) for attachments with auxiliary hydraulics, such as augers or grapple buckets. It also has a slide-up overhead front door and on/off self-leveling capabilities. The SVL65-2 is powered by a 68-horsepower engine and with a wide operating capacity range of 2,100 pounds at 35 percent or 3,000 pounds at 50 percent. Other models in the line are the larger SVL75-2 and SVL95-2s models. Click here for more about the SVL line of track loaders.